Oman had never really been at the top of my must-see list. Having traveled to quite a few countries of Arabic and Islamic influence, I generally know what to expect: friendly people, early morning call-to-prayer wake-ups, and pesky alcohol restrictions. I’ve had many great experiences in these places and made dozens of friends, but despite that I generally favor traveling to other regions of the world (what can I say–the availability of cold beer is just that important to me). When my friend and fellow adventurer/entrepreneur Jackie suggested that we visit Oman over the holidays, I soon found myself researching all I could about the country. Initially I was just eager to check another country off the list, but beyond that didn’t have many expectations. I figured it was just another sand-swept Egypt/Morocco/UAE-type locale, but the more I researched, the more excited I got–this was going to be a pretty epic trip. The plan was to fly from Dubai to Muscat post-Christmas, rent a SUV, and use the next ten days to explore the country–from Muscat in the north to Salalah in the south, and back. We’d grab food and camping supplies at the supermarket upon arrival, then head out on the open road, alternating nights between hotel stays and camping. 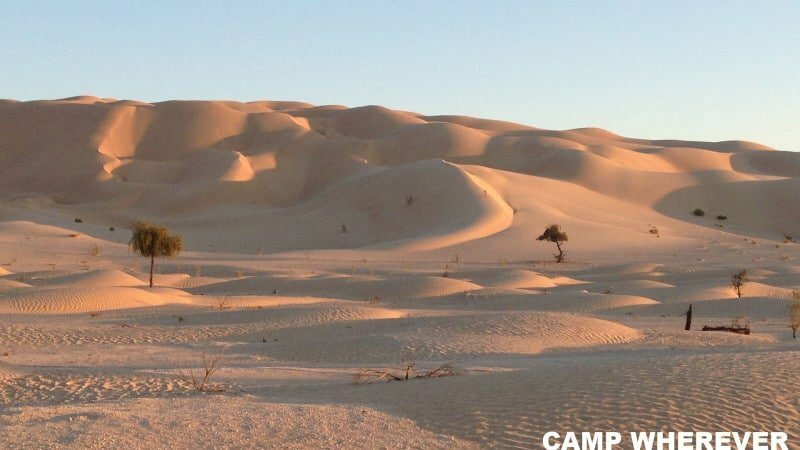 One of the most unique things about Oman is that you can camp just about anywhere you’d like (with the exception of some nature reserves, private establishments, and military bases). That means that you can just drive off the road at any point, look for a good spot, and start setting up for the night. This led to some pretty amazing stays in the sand dunes, coastal areas, and desert oases. The country is overwhelmingly safe, and there aren’t really any animals to give you trouble, so there isn’t much to worry about. Upon leaving the airport you notice how clean and well-kept the road and general surroundings are. It isn’t a Dubai-type of cleanliness either–it’s actually aesthetically pleasing in a very organic way. Neatly manicured hedges line the roads, drivers are courteous and seem to know how to operate their motor vehicles, the tarmac is in perfect condition with nary a crack to be seen, and adequate, legible signage directs you to your next destination. This perception of cleanliness would be challenged at a few points during our time in the country, but at least they made the effort to make a great first impression. Muscat is a modern town, with all of the trappings that go along with the title. There were multiple Carrefour supermarkets throughout the city, with one conveniently located close to our hotel. It’s at this sprawling location that we did most of our road trip shopping–the convenience of everything in one place making our late night experience considerably easier. I had done some online research in the weeks prior and had a decent shopping list ready to go. We divvied up tasks and set off to grab what we thought we’d need for the next ten days on the road. It took a couple hours and more than an entire shopping cart full of goods before we were finished–camping supplies, food, water, fire-making accouterments, etc., etc. To be fair, the amount of “stuff” would have been considerably less had we decided to stay at hotels and eat at restaurants throughout the duration of the trip, but what would be the fun in that? In the end we spent about $300, the bulk of it dedicated to those four nights that we’d be camping under the stars. It was a bit pricey (we could have gotten hotel rooms and meals for the same price), but we figured the experience would be worth it. You might be thinking to rent a Toyota Corolla or similar-size passenger car. Well, think twice. I too was tempted by prices as low as $13/day. I had done my research, and all signs pointed to the fact that the road system throughout the country had undergone vast changes during the past few years. Now everything was beautifully paved, with gravel roads becoming more and more scarce across the land. This is true–almost all of the main roads, from Muscat to Salalah, inland and coastal–are now paved and well maintained. There were definitely times (I’d say three of our four nights) where our desired camp site would not have been reachable had we been driving a 2WD car. It’s also worth noting that between two people and all of the gear we had purchased, the interior quickly became quite packed with stuff. We might have been able to cram everything into a car, but getting things out and repacking would have taken up a LOT more time in that case. 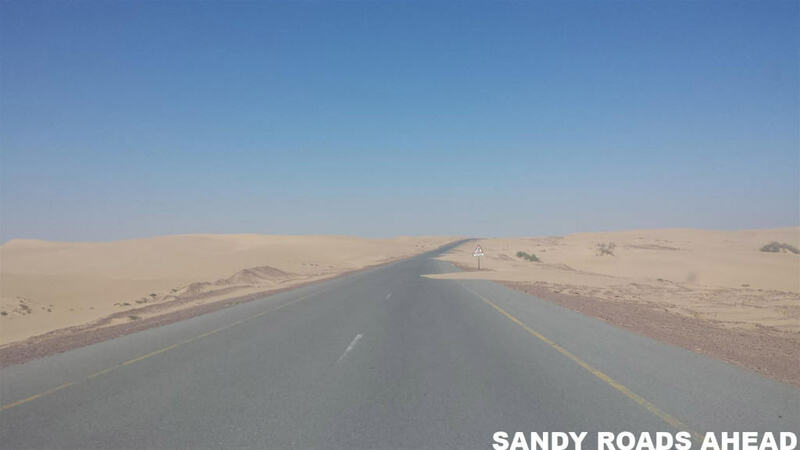 Be careful when dune bashing in the Empty Quarter or the Wahib Sands areas (a popular activity for tourists). It looks like a lot of fun (it is), but unless you a.) know how to drive in thick sand, b.) have another vehicle go with you for back-up, c.) know how to tow and have tow ropes, d.) know the terrain, and e.) have a tire inflator in your possession, it could be a very foolhardy thing to do (you could easily get hurt, lost, or die if not prepared). 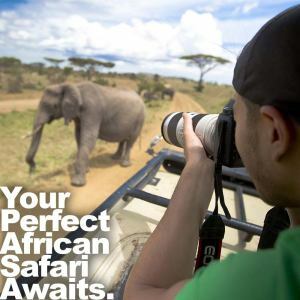 Your best bet may be to employ the services of a well-reviewed tour company and accompany them and their experienced driver for a day or two in the dunes instead. I had taken great care to plan our route–this was possibly going to be the only time I ever visited Oman, and I wanted to be sure to not miss anything. I combed the Internet for blogs, reviews, maps, and any other source of information I could find regarding driving across Oman. Much of it was outdated, some of it so much so that it seemed to describe a completely different country than what stands today (even in as short a span as five years). I was mainly interested in road conditions, historical sights, and potential camp sites, and after a few days of research I began to have an idea of what awaited us. I began constructing my own map (above), marking things to do and see along our journey, in order to more easily organize all of the data I had collected. I knew we wouldn’t be able to get to everything, but I figured we might as well have our choices clearly laid out in front of us. We spent most of the first day doing a long, boring drive through the desert. After eight hours or so we made it to the point I had marked on Google Maps–a camp site recommended by one of the few detailed road trip blogs I had discovered online. We scrambled to find a decent spot to camp without getting stuck in the sand dunes, the setting sun throwing long shadows over the landscape and making the going a bit treacherous. If we got stuck there weren’t many options open to us–we were quite a ways off of the main road, with no phone signal, and no towing services for hundreds of miles in any direction. Moving as far away from the main road as possible, we scurried to set up camp. Popping the back of the SUV, we took out the tent and fire-making supplies, laid out the chairs, and turned on the tunes. Jackie worked on the food preparation while I scouted for kindling until it got dark (we had searched for proper firewood along the way with no success, but luckily there was enough dry tinder laying around to do the trick). Our campfire chili didn’t turn out as well as we had hoped, but it ended up being quite the amazing first night on the road. Despite the fact that we were in the middle of nowhere, there happened to be a military base located further up the road, near the border with Saudi Arabia. We got an unexpected wake-up call at 4:30am when a truck started driving through the dunes towards us. We could hear the vehicle and see the lights flashing brighter and brighter as it approached ever closer. I made moves to get ready for an early morning interview, but they turned around and left as quickly as they had came. Just as well–neither of us was getting much sleep as a result of the cold combined with an unpleasantly hard sleeping surface (the foam mats we bought were useless). It was almost time to get up to see the sun rise over the dunes anyway. Climbing the dunes and watching that sunrise was a real treat–one of the more beautiful sights I’ve ever seen, and not a soul to be seen in any direction. 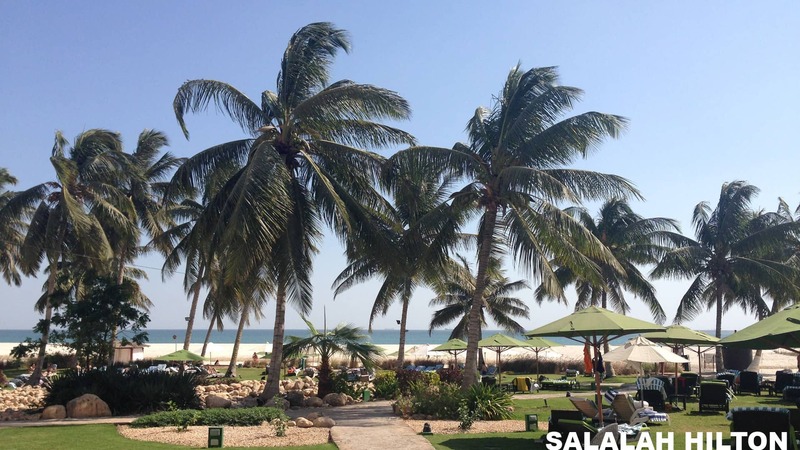 The next few days (including New Years Eve) were spent in the southern port city of Salalah. There we enjoyed the relatively lux accommodations of the Salalah Hilton, a bit of a step up from anywhere else we’d be staying in the country. Salalah itself is a very nicely manicured, smaller version of Muscat. There is definitely more of a provincial feeling than its big brother up north, but that didn’t stop rush hour traffic from making itself known at inopportune times. We spent our days there relaxing, exploring the city, and visiting nearby attractions (oases, ruins, beaches, etc.). 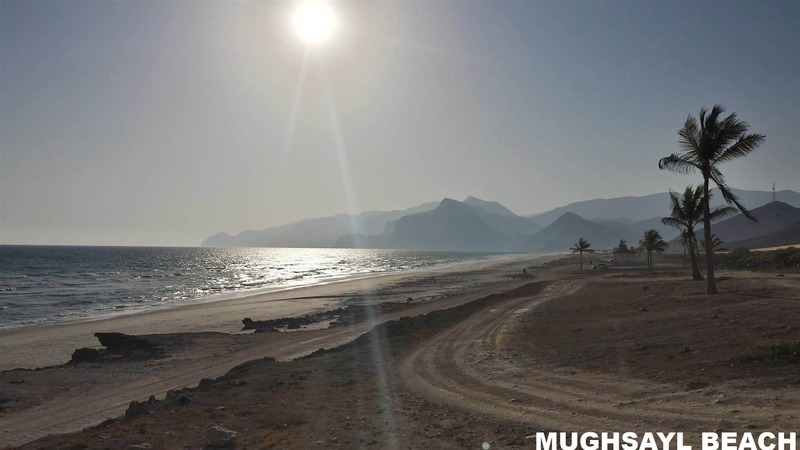 One highlight was definitely Mughsayl (Mughsail) beach, a deserted strip of sand off to the side of the road heading west from Salalah towards Yemen. 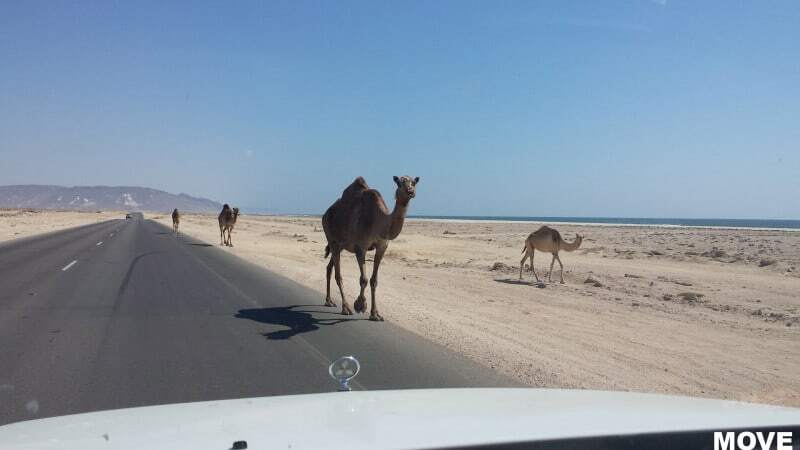 There are blowholes (where waves cause ocean water to spray up dozens of feet), a nice roadside eatery serving camel (see Cuisine below), and a very windy mountain road just beyond the beach that provides for some entertaining driving and gorgeous photo opportunities. I’ve been a certified SCUBA diver for a few years, and Jackie had just completed her PADI course in Jeddah, so we decided to do a dive near Salalah halfway through the trip. We had heard that the shore diving was pretty spectacular in southern Oman, and online reviews confirmed this. 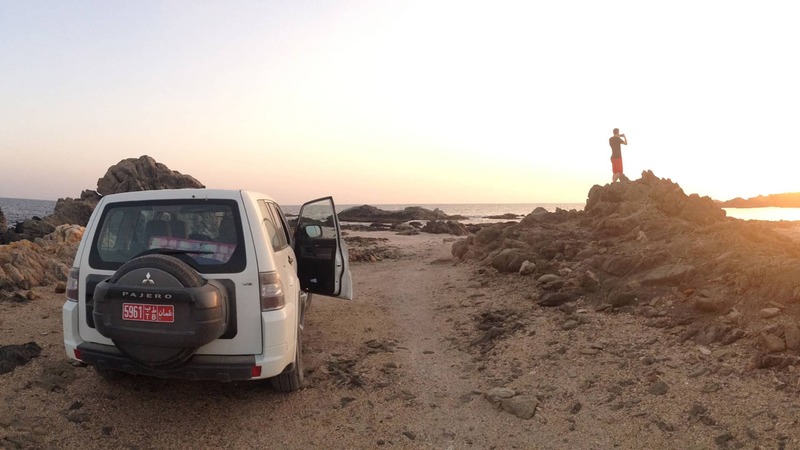 We booked through the Hilton Salalah and decided to dive Eagle Bay, near Mirbat, an hour’s drive along the coast (where the conditions were more favorable this time of the year). We headed to the Mirbat area the day before and set up camp just before dark fell (again), in a sheltered cove a ways off a dirt road extending out from the village proper. Unbeknownst to us, the dive was about 100m (300ft) away from the spot we had picked to set up camp. The visibility wasn’t great due to quite a bit of wind the next morning, but we still managed to see quite a bit of fish, turtles, octopus, stingrays, and the like during our two dives. From there we set off pretty late in the day on a coastal road that provided us with amazing views of the ocean mixed with (more) long stretches of boring desert driving. It was a bit less monotonous than the drive through the desert to get to Salalah, but it was still pretty trying at times (especially after you’ve done two dives). 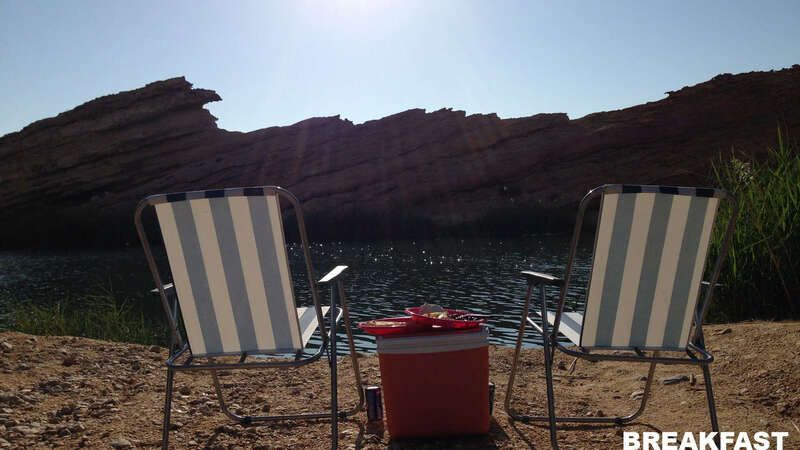 We were rewarded after a couple of hours with the most impressive camp site yet–a real-life oasis near the sea. As per usual, we pulled in just before dark and quickly got to selecting the best spot to set up camp and begin food prep. Spotting another group of vehicles through the trees a few hundred feet away, we set off to introduce ourselves to our new neighbors for the night. 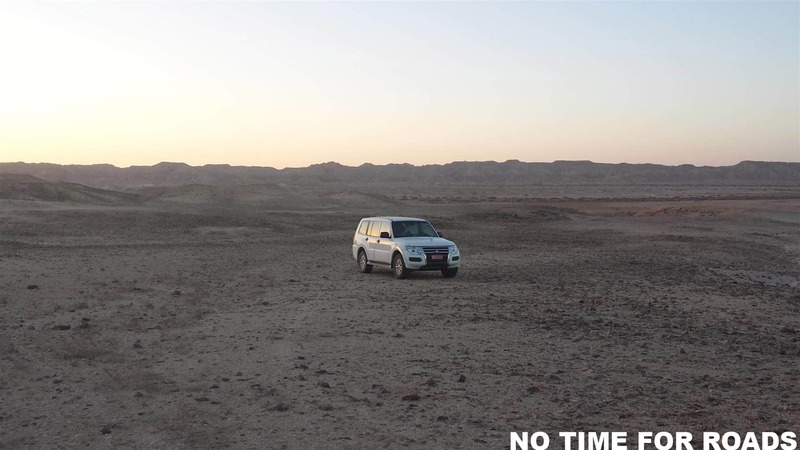 We expected a group of locals, but turns out it was a group of Czech friends and their families, led by an intrepid explorer who had just driven his Land Cruiser from the Czech Republic to Iran, then circling around to Oman. My kind of guy! We quickly got to geeking out over his custom SUV and chatting about our respective adventures on the road. Apparently he was a regular to Oman, having been a few times prior, and he invited his friends to visit him in Oman for this leg of his trip. They were waking up early the next morning to head down the way we had came, so we said our goodbyes and got back to preparing dinner before clocking out for the night. The next morning we hiked to a secluded beach for some swimming before setting off on the road again. Oman is dotted with oases (wadi in Arabic)–islands of green in an otherwise sand- and rock-dominated landscape. Most of these bastions of fresh water are natural locations for development, and are now occupied by towns and villages, but others are a bit more remote and have escaped a similar fate. 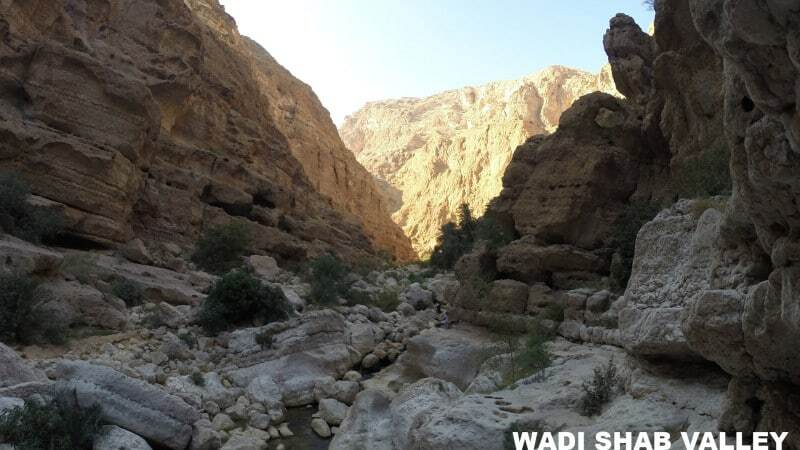 Wadi Tiwi is only accessible by driving up a narrow, winding road that passes through a few small villages along the way. The route is a bit hair-raising at times, but wow, is it ever worth it. Some of the most amazing mountain scenery is right here, before and after you get to the actual oasis itself. The road actually goes all of the way through the mountains and comes out on the other side, connecting with a main road in the west. We didn’t have enough time to do more than about 1/3 of the journey before we had to turn around and head to Wadi Shab, but we would have done the whole thing if we had the time. A definite must-do (4WD highly recommended). Wadi Shab is just to the north of Wadi Tiwi, and is known as one of the most popular day-trips near Muscat (about a three hour drive away). You start with a quick ferry ride across a shallow inlet, and then continue on foot from there for another 45 minutes or so until you get to the main event. On most days there would be a huge mass of families and tourists picnicking and swimming at this remote waterhole, but lucky for us we had arrived a bit late and everyone was already packing up to leave. This allowed us to explore the area in relative peace and quiet, which for me is always preferable to screaming children and masses of Speedo-wearing Europeans. Continuing upstream through a combination of navigating slippery, pointy rocks with your feet and swimming, you’re rewarded with access to “the cave”. This is a grotto that is only accessible through a narrow gap in the rocks, which you must swim through, being mindful not to bump your head on the way. Inside is a small waterfall, illuminated in a few places by rays of light from outside. There’s a rope you can climb up if you want to explore even further upstream (more mountains, more water). It’s a pretty cool spot, but I can only imagine the cacophony of sound bouncing off the rock walls during peak tourist hour (as we could barely hear ourselves). The Omanis were all quite lovely and welcoming, without exception. One thing that surprised us was the amount of people of Indian/Pakistani/Bangladeshi descent (hereafter referred to as “Indians” for simplicity’s sake). Apparently the relationship between Oman and India goes back many hundreds of years, when the sultanate of Oman was a powerful trading empire with ports across the Arabian peninsula, stretching on down the coast of East Africa. To this day many Indians make Oman their home for a stint, earning considerably more than they would back in India. In most cities it seemed that Indians, or people of Indian descent, were the predominate population. There were times where it seemed a struggle to spot an ethnically-Arab Omani in the crowd, especially in the more cosmopolitan cities of Muscat and Salalah. This was in sharp contrast to places such as the UAE or Saudi Arabia, where many of the Indians you see would be those “imported” into the country to be construction workers, drivers, gardeners, or other low-class, menial worker positions. In Oman they were a part of the fabric of normal society, not separated and tucked away from the everyday life of the Arab majority. We did find it a bit odd near the end of the trip as it finally dawned on us that we would drive hundreds of miles a day, through town after town, and never see a single woman out on the streets. Jackie mentioned how even in Saudi Arabia (where she had lived for a few months prior)–a country famous for its strict interpretation of Islam and covering up of its women–you would see women throughout town shopping or traveling about with their children. In the last large city before returning to Muscat we finally spotted some women walking along the corniche after sunset prayers, but all of them were of Indian descent (with the exception of one or two women walking with their husbands). This struck both of us as a bit weird, as Oman seems a lot less religiously restrictive than its neighbors, but maybe there is more to it than we know. If there’s anything that can draw me to a country it’s the availability of delicious food. I’m a sucker for a well-cooked meal and love exploring regional cuisines when traveling, a la Anthony Bourdain. I’d even go so far as to state that food is half of the reason why I travel in the first place (it’s where half of my budget goes, that’s for sure). Well, unfortunately Oman falls a bit short in this department. It should have been an early warning when the number one rated restaurant in Muscat is an Indian joint (which we went inevitably checked out–it really was quite good). You see, Omani cuisine isn’t really a thing–especially as it pertains to most of modern Omani society, many who would much rather go out and grab some Indian or Lebanese than eat traditional fat-covered camel meat. Speaking of, we were lucky enough to try some traditional camel recipes when we visited a roadside stop a ways west of Salalah (near Mughsayl beach). We had been seeking “traditional Omani food” in vain ever since our first night in the country, and upon spotting a sign that proclaimed the availability of local food we decided to give whatever it was a shot. What we were presented with was five different cauldrons of camel meat, eat prepared in a different way. There was camel meat with rice, dried camel meat, camel meat stew, and camel meat covered in fat paste (proclaimed by the operator as the most famous and delicious of all the choices). We tried a bit of each, and decided that the safest bet would be the rice dish–a kind of camel fried rice if you will. We had arrived between lunch and dinnertime, and they almost didn’t even serve it to us (“no, no, you don’t want that–it’s a few hours old!”), but we persuaded them that we were hungry enough that we didn’t care. Soon they dutifully brought us a couple of plates, along with a thermos of tea and generous helping of local dates. We actually ended up returning again the next day for the same meal–it was quite a bit less expensive than any of the options we had back in Salalah, and didn’t taste half bad either. Other than that one occasion, our menu consisted of campfire meals, Lebanese, Indian, or hotel food. Not much variety, but we managed quite well on most nights (the campfire chili on the first night really was a standout disappointment though, sadly). A special mention goes out to Slider Station, a wonderfully-decorated American eatery that specializes in gourmet sliders, cheese fries, and all of the other bad-for-you foods you could ever dream up. It wasn’t cheap, but it was a welcome respite from the campfire meals we had struggled with at times over the prior few days. Go and check it out–especially if you are into camping. I had always wanted to do wild camping like that, but never knew where. Well, that place is Oman. If you’re heading anywhere near the UAE you really don’t have much of an excuse not to visit, as flights and buses to Muscat are cheap and plentiful, and visas can be arranged on arrival (for as little as USD$13). Personally, I’d take Oman over UAE any day. Sweet trip. Never thought of Oman as a cross-country camping destination. Put me down for being up for similar excursions in the future :). I toyed with the idea of visiting the region for some time. My grandpa used to pass Aden, Yemen quite a bit for work. Getting in touch with ‘my roots’ there would be interesting, but probably would require a bit more research to make that safe enough. Yaaaah…may want to hold off a bit on Yemen for now–things are getting a bit too dicey, for even my tastes. I am planning a trip to Oman soon. Was wandering where have you found 2wd for 13$/days? Any website or agency in Oman to recommended? And where have you rent your 4wd? Hey Alex–glad you found it useful/enjoyable. I was able to find a low price by searching online at least a few weeks before my trip on https://www.skyscanner.com, which provided me with quite a few options. The time of year you go affects pricing as well, remember. We rented our vehicle through rentalcars.com. Thank’s for your help and fast reply! Wow, what a great story. 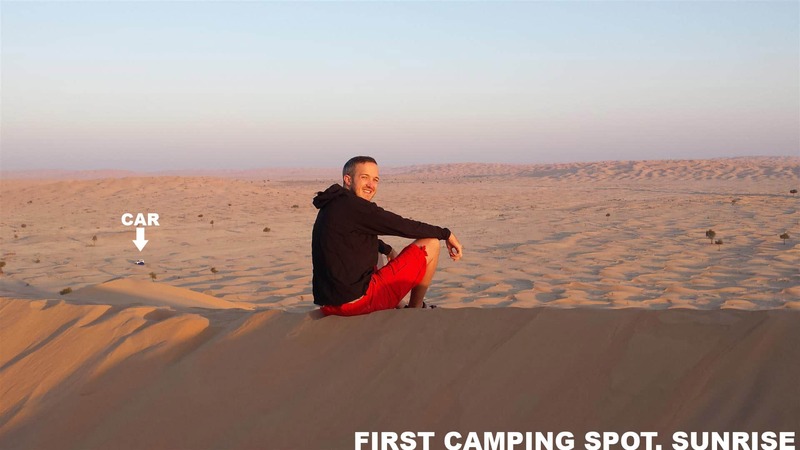 Never thought Oman would be a wild camping destination. I found your page because I was planning on doing a roadtrip this christmas. I was a bit sceptic at first because of the temperatures, but your story changed my mind about the whole trip and now I want to go. What place did you rent your car from? Thanks a lot for the fascinating and complete report, loved it. Thanks for the good words Raphael! It was definitely quite the trip–would love to go back one of these days and see the bits that we weren’t able to catch. We rented our cars through RentalCars.com, a search-engine aggregate site that put us in touch with a local company there. Enjoy! Could you pls send me a link of a few of those blogs you referred to ? I am an Indian living in Muscat for more than 15 years and enjoyed reading your write-up. 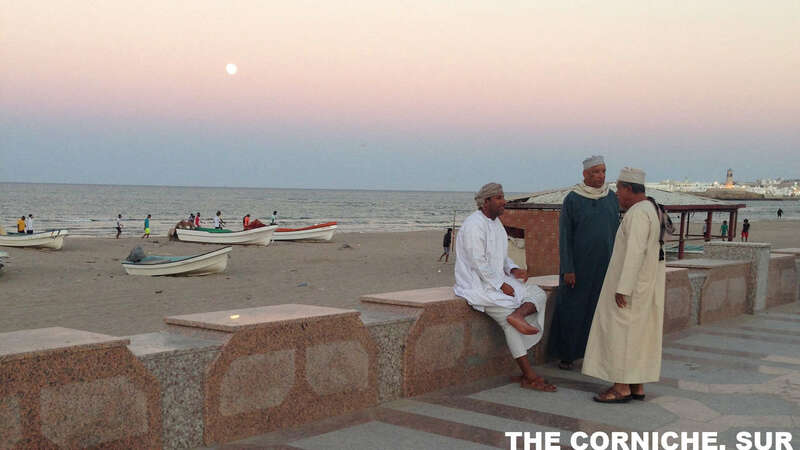 Next time you visit Muscat you could check with me on where to eat traditional Omani food. There is a place started up recently and its good. See you next time in Muscat! Big thanks for sharing your Oman stories and especially that map. I’m coming to Oman in few weeks and that map helped me a lot to make my own. Keep being awesome. Great blog. Loads of useful stuff so thanks for that. I am going on a trip at the end of March/April for 2 weeks. How much did you allow budget wise? Did you find diving expensive? I was thinking about doing my Advanced diver course out there. Is there anything you would recommend bringing from home that out could not find out in Oman? Budget-wise, it cost about USD$300-350 for all of the camping supplies that we bought in Muscat. This can be reduced by bringing your own tent, chairs, sleeping bags, etc. of course. We got a very decent deal on the Pajero we rented, at about USD$55/day through RentalCars.com (prices fluctuated, so best to search a few times on different days to see the current ranges). Great blog, do by any chance have a more detailed day by day itinerary? I planning a road trip in April for about 10 days a and struggling with my map. Covering everything in week to 10 days seems difficult considering I also want to cover Musandam for diving. Any help would be great.